HP created and implemented a disaster recovery plan for BAT Italia, across data and desktop, to comply with the Group’s global standards. 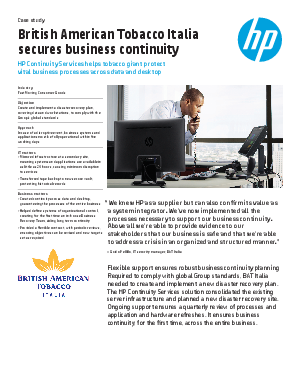 Read how the HP approach consolidated the existing server infrastructure and planned a new disaster recovery site. And ongoing, flexible support provides a quarterly review of processes and application and hardware refreshes, thus ensuring business continuity, for the first time, across the entire business.